The Breezer, which was wounded last week, has been repaired and is once again cruising the streets of the city, so we got out for a pretty good ride around town on Saturday. 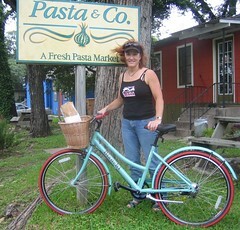 Kem decided to replace her Biria with the Bianchi Milano “Cafe Racer” you see pictured here. It’s a very cute little bike I think with its classic Bianchi paint job and she’s finding it more comfortable to ride than the Biria. It was a nice change of pace from recent road bike rides and our afternoon ride turned into something of a wine tasting outing. We went by the Austin Wine Merchant early in the afternoon. They have great tastings on most Saturday afternoons. Then later we pulled into Vinosity near Kem’s place for a sandwich and their usual Saturday afternoon tasting. Not a bad way to while away the afternoon. And lest anyone wonder, no, our meager tastings we were not enough to lead to any BUI (‘biking’ under the influence). Round the corner from Vinosity is Pasta & Co. where this picture was taken. We loaded up on fresh pasta & sauces for a dinner later that night we were planning with S & C. All in all, a fun afternoon of tooling around the city by bike.